Polished porcelain tiles have significantly grown in popularity since the mid 1980s, traditionally lending themselves to commercial applications, porcelain tiles are fast becoming fashionable for domestic applications through a combination of aesthetic appeal and durability. Two months after installing glazed porcelain floor tiles in a domestic kitchen the tile supplier/installer was contacted by an unhappy customer who wanted an explanation as to why the newly tiled floor was becoming increasingly stained and scratched. The supplier/installer inspected the flooring but was unable to establish a logical explanation for the irremovable staining and scratching. Lucideon (which was at the time called Ceram) was contracted by the supplier/installer to determine the cause of the staining and scratching to the recently laid tiles. We conducted ISO 10545-14 staining tests, ISO 10545-7 abrasion tests and Scanning Electron Microscopy (SEM) analysis on both the laid tiles and virgin tiles left-over from the original installation. The findings were then benchmarked against the performance criteria of EN 14411. Microscopic analysis confirmed that ‘patches' of the engobe layer were exposed causing the tile to become susceptible to staining and scratching. The engobe layer is situated between the tile body and glaze and acts as an obscuration layer (Fig. 1). 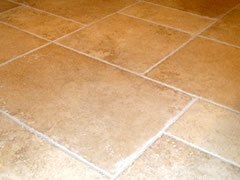 Over-polishing the glaze of a naturally irregular tile surface is likely to cause exposure of the engobe layer on and around the peaks. The engobe layer is far softer than the glaze and therefore highly vulnerable to scratching and staining. The tests also revealed that patches of the engobe layer were exposed on the virgin tile surfaces. This proved the issue was across the board (with the batches used for this particular installation), hence the manufacturer had over-polished the glaze during the polishing process (removing too much of the glaze from the natural undulating peaks and exposing the engobe). We were able to demonstrate that the staining and scratching was a result of the manufacturer's over-polishing process. The information supplied by us enabled the supplier/installer to pursue a legal claim against the manufacturer.